What is it about spiders that strikes fear in so many people? Is it the legs, or their hairy bodies, or their ability to attack with a sneaky drop-shot from a hidden web in a corner or on a ceiling? I think it’s probably a bit of all of the above for me. Ever since I was a kid and a large wolf spider ended up hitching a ride on my sweater in my parent’s woodshed, I’ve been pretty much terrified of them. It was with complete trepidation that I even picked this book up at all, but I said I wanted a few scary reads for October, and Ezekiel Boone’s novel definitely fits the bill. Boone builds off of all that we as human beings find so unnerving about spiders in the first place and cranks it up to an eleven in this apocalyptic thriller where the end comes not in meteor strikes or volcanic explosions, but in waves of black-bodied, carnivorous spiders that are hungry for human blood. One great thing about this novel is the way Boone subverts your expectations when it comes to the spiders. There were a few disturbing revelations about the way these spiders work that left me seriously grossed out and looking over my shoulder while I was reading for any sort of creepy crawlies that might have been trying to invade my bubble. Lord knows I’ll be giving any spiders I come across in my house an even wider berth for awhile after reading this book! Told in short and alternating POV chapters, Boone uses the viewpoints of connected characters across the globe to give his readers a front row seat at the start of the pandemic as things quickly move from bad, to worse, to horrifying. I could easily envision this story being translated into a blockbuster format. The only problem I had with it is that it the ending sort of lands with a thud as Boone implies that the worst is yet to come. It’s almost like watching the first 50 minutes of a Michael Bay film or other disaster movie only for the credits to roll before we’ve even gotten the inevitable scene of the statue of liberty getting toppled to really show the audience how bad things have become. That being said, there was a hell of a hook for the second book, so I suppose Boone gets the last laugh there! I had a minor issue with a couple of POV characters being underdeveloped, or underutilized. Shotgun and Gordo, a gay/straight survivalist duo were my favorite characters, and there just aren’t enough chapters with them.Meanwhile, Kim and Melanie got a few more chapters afforded to them than I think they necessarily needed and their voices weren’t quite as distinct as I would have liked. I have high hopes for book 2 though, because I have a feeling some of these side characters are going to spin into the limelight which would pick things up a bit. Similarly, don’t expect many answers as to the origin of the spider invasion, at least not quite yet. Boone definitely focuses more heavily on fast-paced action and gross-out scenes to advance the plot quickly while leaving the larger explanations for future installments in the series. There were a few scenes in the beginning of the novel that seemed to imply some source thousands of years in the making, but the where, how and why are forgone conclusions in favor of focusing on the action and terror that are man-eating spiders. If you’re looking for a good gross out scare and think you can stomach the feeling of heebie-jeebies that thinking about spiders seems to inspire in me and so many others, I’d say definitely give this book a go! I’m excited to pick up the sequel soon. Sorry for all the scary spider gifs! 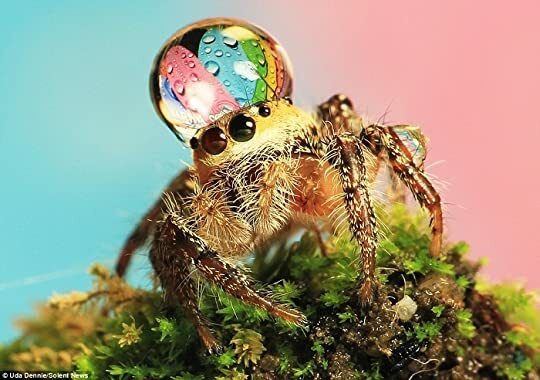 Here’s a cute little spider showing his pride with an adorable raindrop hat to cheer you up! Absolutely loved this review and all the spider gifs! I am not a big fan of spiders in me bunk but otherwise I don’t mind them outside. Their webs can be awesome. But walking through a web or a cannibal spider eating the inside of me head. No thanks. Hahaha yeah when Boone first reveals that the spiders eat people I almost had to nope out of the book! What a freaky twist. Book 2 is great, it’s different in tone but just as good. I completely forgot you used that gif in your review! I’m sorry for co-opting it for my own, I hope you don’t mind. I agree with you about the characters. I didn’t mind that some felt underdeveloped, it didn’t detract from the action which was clearly the main focus anyway. Hahaha I totally understand that response! It was definitely a difficult read for me, that’s for sure! I love to include gifs in all my reviews, but I had trouble searching for some for this, because I was so freaked out! ah man, I despise spiders! they are the creepiest creatures ever and one of those gifs made me really want to jump out of my skin 😀 haha… the cute ones are cute though, no doubt about that! ugh.. that makes me reconsider reading the book, but I am a sucker for punishment… just ran into a big one in the hall this evening… reminded me of the book 😀 uh… will you be reading the sequel? This book sounds like it would be so creepy to read. One where you skin sort of crawls while reading it. Great review!! I’m gonna have to just go with your judgement on this one. I am terrified of spiders and you had me having goosebumps and shivers after “waves of black-bodied, carnivorous spiders that are hungry for human blood.” 10/10 Already spooked and will not read. Great review though! …I partially wanted to dislike this because the spider images and a book about spiders is one of my worst nightmares…arachnophobia right here! Ugh those GIFs were so bad I actually screamed out loud. This book actually sounds pretty good though! I don’t think I’ve ever read an apocalyptic book that involves spiders, or even heard of one. Another wonderful review!